That creates a problem for us. Francis makes statements. Alot of statements. Which are pronouncements, and which are "just cuz" remarks? Unlike all other previous popes, Pope Francis is famous for making all sorts of statements that do pertain to faith and morals, but without the desire for clarity; in an era of ubiquitous microphones and worldwide propagation in seconds, that leaves no room for error. And yet he persists in off-the-cuff statements that confuse both liberals and conservatives, and the acceptance of them is cluttered with everything from vagueness at best to what appears to be heresy at worst. In other words, if the Pope is infallible in matters of faith and moral, how can he be making statements about faith and morals that are so demonstrably contrary to prior infallible statements? Even if they aren't wrong but instead just goofy, these statements are exploited by everyone from NCR and CNN to billionaire George Soros and Kiko Arguello. 10/1/13, La Repubblica interview with Eugenio Scalfari on a very restricted view of proclaiming the Gospel: "Proselytism is solemn nonsense, it makes no sense. We need to get to know each other, listen to each other and improve our knowledge of the world around us. Sometimes after a meeting I want to arrange another one because new ideas are born and I discover new needs. This is important: to get to know people, listen, expand the circle of ideas. The world is crisscrossed by roads that come closer together and move apart, but the important thing is that they lead towards the Good…Each of us has a vision of good and of evil. We have to encourage people to move towards what they think is Good." Now in these examples—taken in context and in light of the whole Tradition--they sort of make sense, which is to say, I understand what the Pope is driving at. He has a flair for the dramatic, for over-statement. But taken in isolation, they are devastating. In fact, they are SO devastating that there’s a whole cottage industry built up around “interpreting” Pope Francis. That any pope in making statements about faith and morals needs an interpreter of his intended teaching is utterly unheard of. And this, as much as anything else, needs clarity if we are at all to take the Holy Father seriously as the Vicar of Christ while he is at the same time reversing what the Church has always taught Magisterially. It creates a situation where an ordinary Catholic may be compelled to disagree with the Pope in order to hold to the Magisterium--which is self-contradictory. And in this sort of confusion, obedience somehow becomes disobedience, and there are eternal consequences. Yeah, there's a lot at stake. There’s an old saying among the Italian clergy: every priest sees himself as either a theologian, a liturgist, or a pastor. This doesn’t mean that they don’t have all of these qualities in some way, but rather that they have a particular focus that defines who they are and colors the other two. To my mind, Archbishop Apuron clearly thinks of himself as a liturgist. I say this because he truly does enjoy singing the Mass parts, as well as some of the remnants of the “high mass,” such as the white vestments he uses for daily wear and standardized use of the old form for the blessing of the faithful. He releases his CDs and mandated that they be played often on the radio. He wore his white vestments even when taking seminarians (as in 20 of them) in Agana (in all my years I’ve only known him to not wear the whites once per year, and that was at St Francis fiesta when he dusts off his Capuchin habit). If you will, I’d say he loves the theatrical part of liturgy, and the liturgy truly is theatrical in its way. In other words, what others might think of as “trappings” or “accoutrement,” he views as his link with apostolicity. This is not a slap at him at all, just a recognition of how (I think) he sees himself. For him, his theology and his pastoral flow from the liturgy, and we see this especially clear in his devotion to the Liturgy as celebrated by NCW—this has colored everything else in his reign on Guam. On the other side is Pope Benedict XVI, aka Joseph Ratzinger, who is to my mind the greatest “theologian-Pope” since ever since (not ever, but definitely in a while). His razor-sharp intellect could penetrate through the murkiest of texts, and he was and is able to makes connections and draw conclusions that are missed by most other readers. A theologian’s theologian. Benedict is of course a lover of the liturgy, particularly the Extraordinary Rite, and he worked to be pastoral. But his real heart is in theology, and the pastoral and liturgical facets of him flow from the theological. Then there’s Pope Francis. He is, heart and soul, a pastor. Care of the flock as a whole isn’t his primary concern; it’s his only concern, even to the detriment of theology, if need be. That sounds like a strange thing to say, but as the Holy Father himself shows, he thinks very little of those who seek clarity in thought and word about doctrine as he regularly shows contempt for theologians. Instead, he says, because “life is greater than explanations and interpretations,” the Christian faith is somewhat same-same regardless of denomination, of which (to him) Catholicism is only one among very many. Hence, if doctrinal issues are a problem, then solve them by substituting pastoral practice in their stead (e.g Lutherans can receive the Eucharist if their conscience permits; likewise, most Catholic marriages aren’t valid but many second marriages outside the Faith are; and so on). In other words, Francis’ pastoral takes absolute primacy. But if the Pope is the ultimate safeguard for doctrine, and he's infallible, how can he do that? Well, he can't--not without exposing us all to terrible consequences. But he's the Holy Father, and God has appointed him and leads him by the Holy Spirit. How can anyone synch this up? Well, CDF head Gerhard Cardinal Muller says, the Holy Father isn’t a professional theologian, but rather one whose theology “has been formed by his experienced in the field of pastoral care,” which has in turn been formed by his South American outlook, which is itself distinctly different from other areas of the world. That’s all well and good, but it sound a lot like "do whatever you want as pope or bishop or laymen, just so long as it spiritually feels good." The only good news here: reports show that Pope Francis fully trusts Cardinal Muller, who in his position is there to make sure the Church remains faithful to the Tradition, and therefore by implication relies on him for actual Papal pronouncements, which are by definition different from off-the-cuff remarks. My answer is that even the statement “Jesus is Lord” is a doctrinal statement, as is the statement "God is Love." The teaching authority of the Church—its Magisterium—is precisely the authority to teach doctrine and say what these two statements truly mean. Unfortunately, Pope Francis has a very different notion (compared to the last 200 years) of what that Magisterium means on a day-to-day basis. 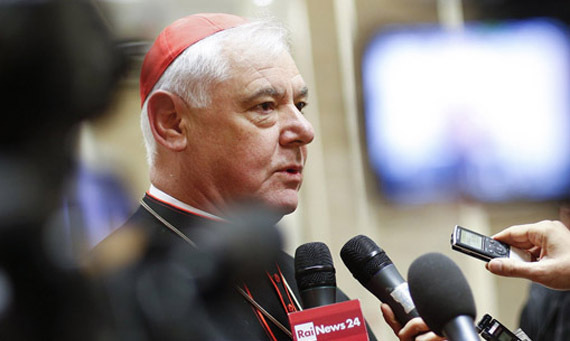 And more to the point, and with all respect to Cardinal Muller's defense of the Pope, since when is doctrinal clarity opposed to charity? When in all of the Gospels did Christ reduce the Gospel to "love of neighbor?" The last time I checked, the Sermon on the Mount's opening chapter is very specific about anger, lust, adultery, oath-taking, and so on; and all of these follow the Lord's admonition, when He says of those who dispense with the Commandments, "Whoever then relaxes the least of these commandments and teaches men so shall be called least in the Kingdom of Heaven." And yet the Holy Father isn't saying that either. In fact, he's all over the place. And whether you or I or the media or Elton John or whoever thinks so or not, all of this talk and media flair have created a condition where those who are not as noble in intention as Pope Francis have been allowed as wolves to mingle with the sheep without even bothering to wear their fake sheep's clothing. This is why I have continued to say DO NOT LOOK TO ROME. I believe the Holy Spirit has permitted all this to happen at this particular time so that we the laity will finally grow up. Thank You for your perspective on the topic of the magisterial, I dare say that although it is the Holy Spirit that chooses these men to the sacredotal office, they still have the free will to respond to or against the call, and as human beings many times are motivated by desires for things of this world, and unless guided by a life of prayers, fall to the weakness of human desires, forgoing the things of God. In short, some of these prelate are more concerned about power and prestigious standing, in lieu of their call to be caretakers of souls. Once again thank you for your thoughts. You ask above: "When in all of the Gospels did Christ reduce the Gospel to 'love of neighbor'"? Nowhere. However, He did reduce the Gospel message of life ("I came to bring them life, that they have it more abundantly") to love when he had a lawyer answer his own question about what he must do to inherit everlasting life: "You shall love the Lord your God with all your heart, with all your soul, with all your strength, and with all your mind; and your neighbor as yourself." Jesus commends this answer. The inclusion of "love the Lord your God" means the Gospel isn't reduced to "love of neighbor" simply. My point exactly. One more comment, if I may. 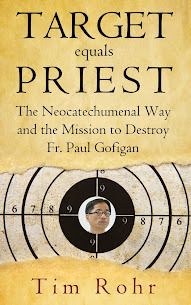 You struggle with this pope: "Unfortunately, Pope Francis has a very different notion (compared to the last 200 years) of what that Magisterium means on a day-to-day basis." You write further: ..."God has appointed him and leads him by the Holy Spirit." My question: How close are you to saying, "Unfortunately, God has appointed him and unfortunately leads him by the Holy Spirit"? Well, given that Pope Francis has reversed clear dogmatic teaching, I'd say we have a problem, yes? Out of all that was in the post, I'm surprised that was your take-away. Your question somehow takes on the mode of "strain the gnat but swallow the camel," if you will. That's the thing about infallibility: all you need is one example of fallibility in dogmatic matters, and everything is turned on its head. Not good. Do not be surprised at Guile's inanity. "An idle mind..."
If loving one's neighbor is a part of doctrine, and the Junglewatch is a doctrinal watchdog, then why are some contributors to this blog belittled? 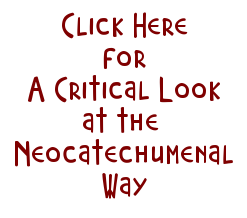 Is belittling another a part of doctrine? If so, then how do loving a neighbor and belittling a neighbor go together? Oh, poor child. Now, look Glaucon, we hurt his feelings. Ummm, Tim, you are NOT a "contributor" to the blog. You are a deceiver. So we belittle you. David was a man after God's heart, yet he manifested human weakness. Judas was personally chosen by Christ, however betrayed the Lord, and in despair took his life, the bishop's and popes were chosen by the Holy Spirit, however their wills are still free to work with the Holy Spirit, or to carry out their desires. Unfortunately there have been some popes and bishop's who have chosen to follow their desires. Pope Benedict XVI frankly acknowledged the fact that cardinals can elect sub-optimal popes in an interview with German television back in 1997. 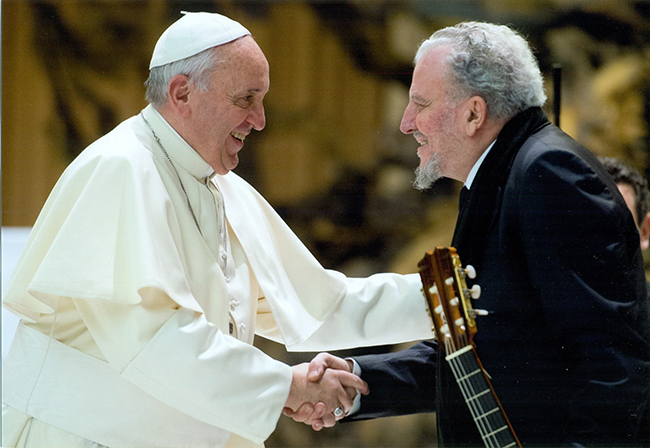 I would not say so, in the sense that the Holy Spirit picks out the Pope. . . . I would say that the Spirit does not exactly take control of the affair, but rather like a good educator, as it were, leaves us much space, much freedom, without entirely abandoning us. Thus the Spirit's role should be understood in a much more elastic sense, not that he dictates the candidate for whom one must vote. Probably the only assurance he offers is that the thing cannot be totally ruined. I believe Glaucon stated that the Holy Spirit appoints the pope rhetorically, since he goes on to show how how Francis doesn't "sync." We've had many bad popes. Fortunately they were to busy sinning to teach error. Francis appears to be making time for it. Fortunately (for him) his apparent referrals of dogma are not official, otherwise he'd be struck dead. Exactly. My intention was to point out certain assumptions about Magisterium and infallibility. Most of these comments made by Francis are unplanned remarks, and because of that, he's certainly liable to being wrong. That said, it's this very penchant he has for making remarks that gives NCW apologists material to justify whatever nuttiness they can. They selectively quote, and usually out of context. Combined with Francis-speak, it makes our job a bit tougher. Great piece Glaucon. Keep Guille out of the jungle, he's a bore. He's infatuated with Glaucon's writings. 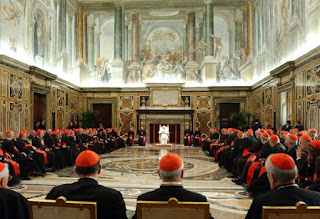 Many Pope's were obviously not the choice of the Holy Spirit, but the choice of the Cardinals who are human and flawed. I agree with Tim, this is a test of FAITH, for the Laity and the clergy, "separating the wheat from the chaff".